Many travelers come to the Twin Cities to shop at the biggest mall in the U.S., enjoy the state’s plentiful lakes, and soak up the music scene of Prince’s hometown. But did you know that Minnesota is home to one of Cedar Fair’s 13 amusement parks? Famous sister parks include Knott’s Berry Farm near Disneyland and Canada’s Wonderland near Toronto. This is no small park, either. It boasts 44 rides, multiple live shows, plenty of carnival games, and a full-sized water park. 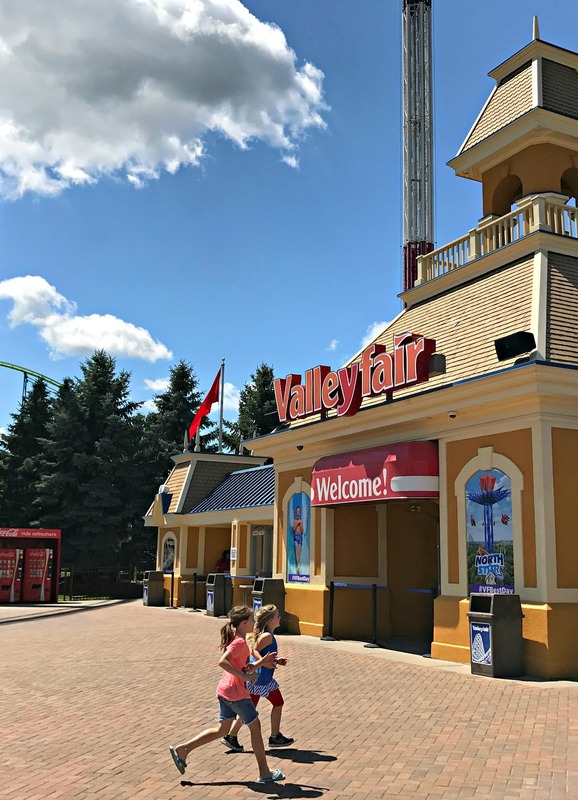 If you’re considering a trip to Minnesota’s Valleyfair theme park, here are dos and don’ts you should know before you go. Do plan on drive time and parking fees. Do make a ride plan. Don’t miss the family rides. Do plan to split up. Don’t visit Valleyfair in winter. Do consider investing in Fast Lane. Don’t try to squeeze Soak City Water Park and Valleyfair into one day. Don’t waste money on bottled water. Do get your photo taken at the Olde Time Photo Shop. 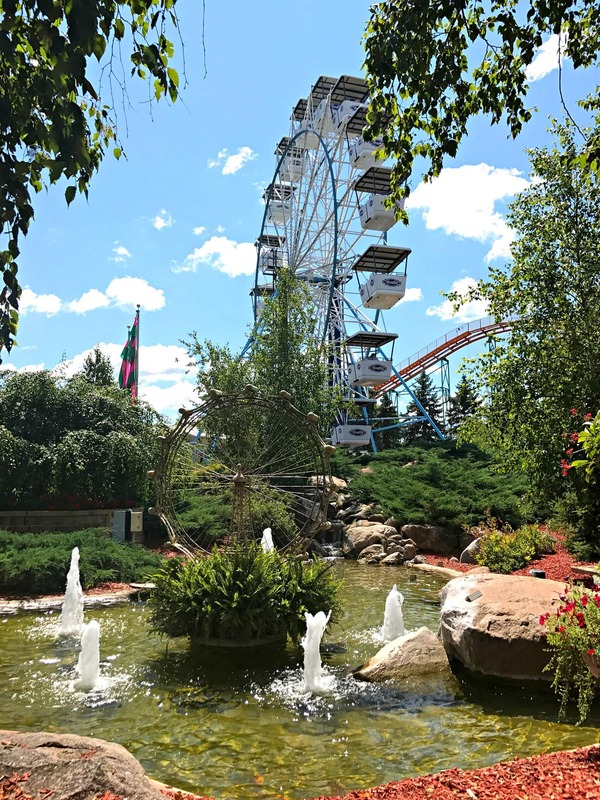 Located in Shakopee, a suburb southeast of the Twin Cities, it will take you about 30 minutes to reach the park from downtown Minneapolis without traffic delays. Add another 10 minutes or so if coming from St. Paul. Don’t be shocked, either, when you must pay a daily parking fee in addition to your admission tickets. Take advantage of many discounted Valleyfair ticket options. You can often find discounts through LivingSocial. Additionally, you might find local discounts through Visit Shakopee’s website or at local Cub grocery stores. Your best bet to avoid long lines, as with most amusement parks, is to arrive in the morning when Valleyfair first opens. Although Valleyfair offers an app with a map, ride descriptions and rider height requirements, it does not provide wait times. And, I only saw an expected wait time posted for one ride in the park. This makes choosing which ride to go on next more difficult than, say, when navigating Disney parks. Take a look at the Valleyfair website before you go and decide which rides are most important for each family member. Then try to group attractions by area of the park and ride the big hitters first. Typically, the newer and more thrilling the ride, the longer the line. 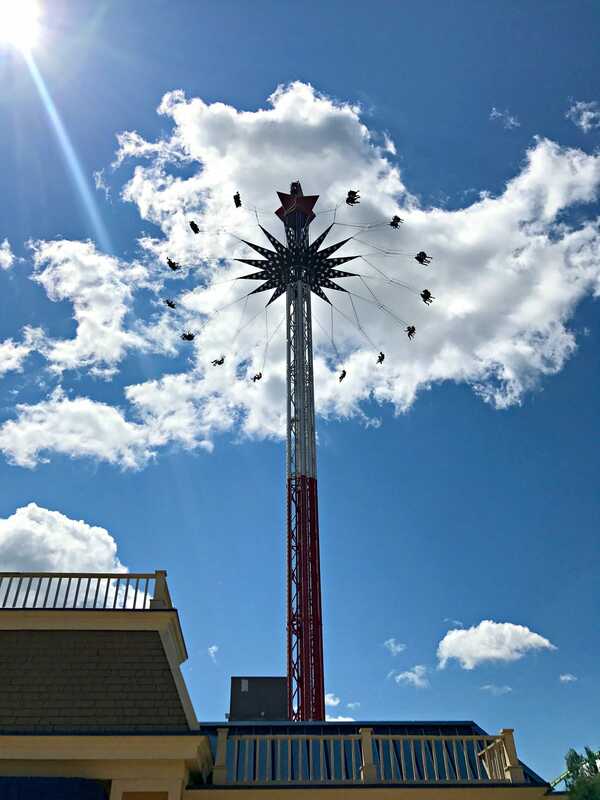 In 2017, the new kid on the block was North Star, a heart-pumping swing ride that spins riders up to 40 miles per hour, 20 stories above the ground. Meanwhile, Delirious, an exciting 70-foot looping coaster ride will open in 2018. 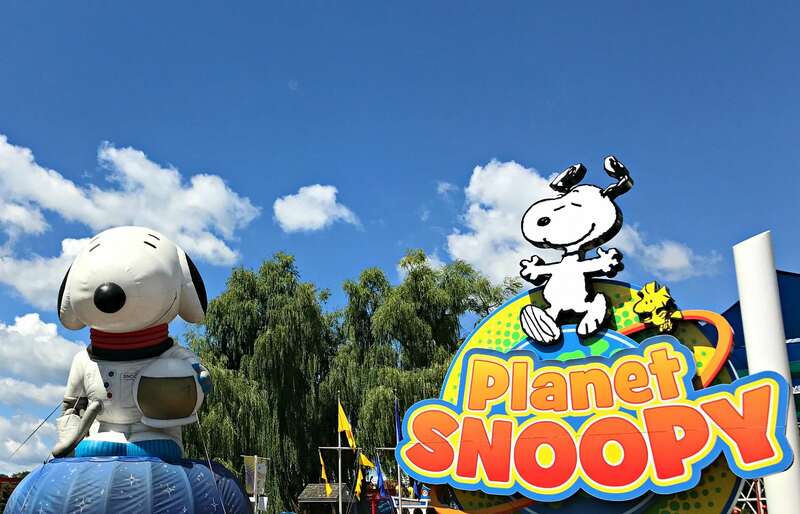 Valleyfair is home to numerous roller coasters plus 17 rides just for wee ones in Planet Snoopy. It does not, however, offer many rides that the whole family can enjoy together. Thankfully, there are a handful of attractions that appeal to all ages. Antique Autos is a favorite of mine from my Minnesota childhood. 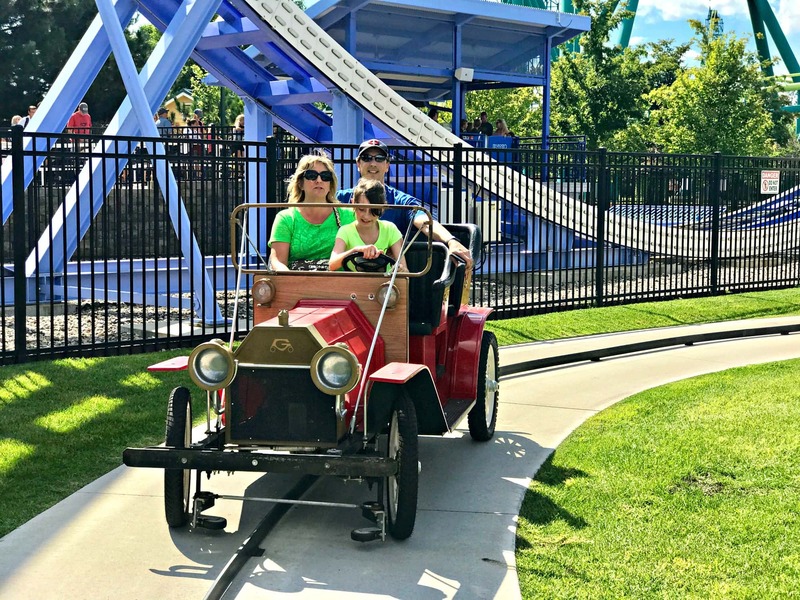 On this ride, kids drive their parents in old fashioned cars along a scenic path with a center guide rail to keep cars on track. For a mellow coaster experience, kids 44″+ can take off with parents and bigger siblings on Mad Mouse. This is a good ride to hit first thing in the morning since cars fit only four people each and it takes a long time to load and off-load. 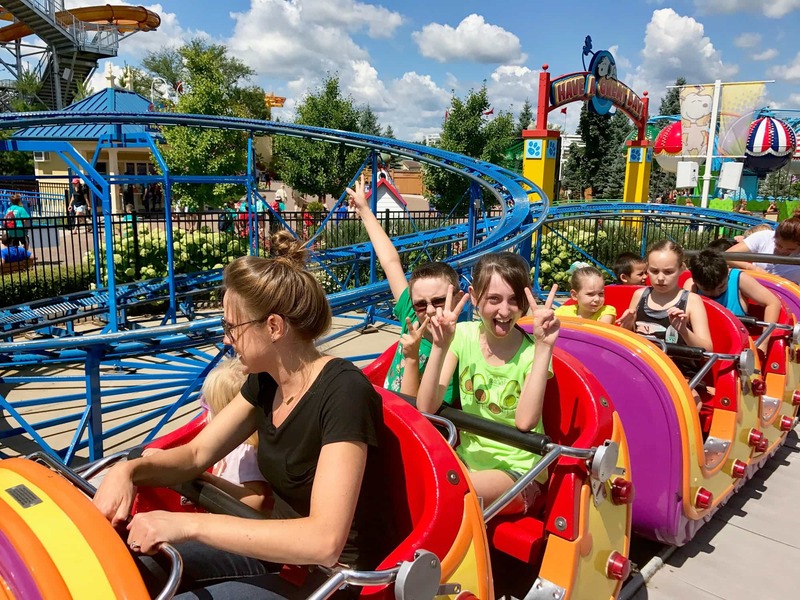 There are a few traditional amusement park rides at Valleyfair that appeal to families, too, like Bumper Cars, the Carousel, and a Ferris Wheel. Meanwhile, Minnesota River Valley Railroad has no height restrictions and chugs through the park, but plan to wait a long time at stops at the front gate and Planet Snoopy. 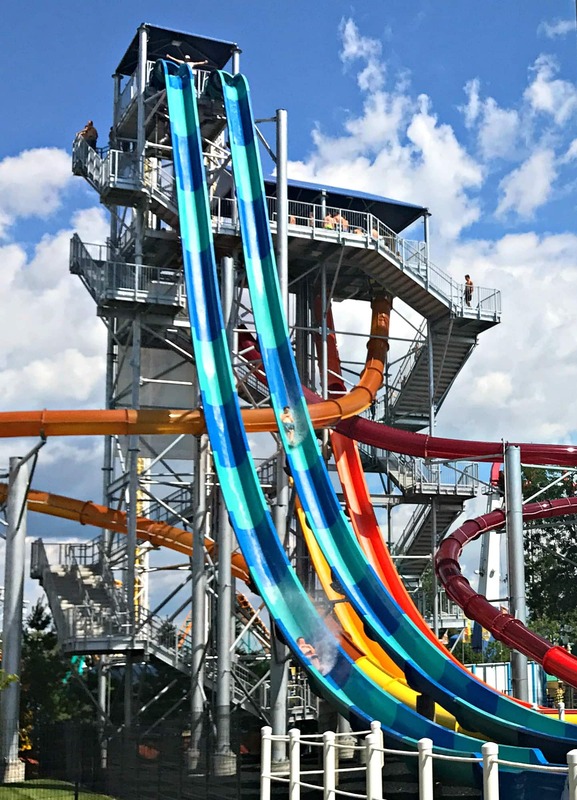 If you need to cool off on a hot day, of course you could head to the onsite Soak City, but there are also a couple of water rides within the main park for riders 46″+. Thunder Canyon water rapids ride is a good choice for families with kids. Fans of the 1990s movie, Little Big League, should take a turn on the Wave. It’s a short ride with a big splash, which was featured in the Minnesota-based film. If visiting Valleyfair theme park with a large group or with kids of different ages, you may want split up for awhile. About half of the rides in Planet Snoopy can be ridden by children alone while parents and grandparents wave from the side. The other half require an adult companion, depending on height. Although mom and dad may love watching wee ones on Woodstock Whirlybirds and the Cosmic Coaster, older siblings will likely get bored quickly in this area of the park. Choose a specific time and place to meet up with older, responsible tweens and teens, and be sure everyone’s cell phone is charged in case you can’t find each other. Valleyfair runs seasonally from spring in mid-May through Labor Day each year, which means it’s closed for Minnesota’s snowy winters. In summer, the Soak City Water Park keeps sliders cool on muggy Midwestern days. Expect a fabulous fireworks display if visiting this theme park on the Fourth of July. In fall, the amusement park offers limited hours on weekends only for ValleySCARE. This is the upper Midwest’s largest Halloween attraction. During the day, expect not-so-scary options at the Great Pumpkin Fest in Planet Snoopy with a costume parade, trick-or-treating trails, a hay bale maze, fall-themed craft projects and more. At night, things turn scary with multiple haunted mazes and live shows like the Sinister Circus. 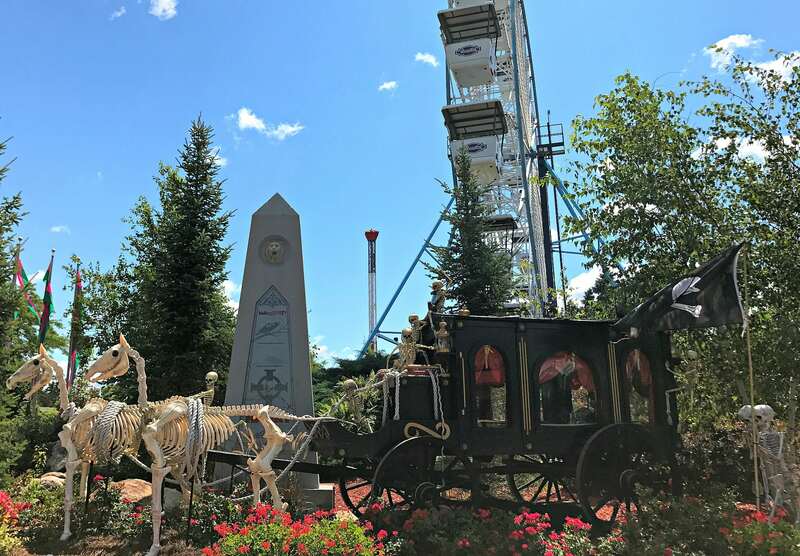 If you dare, wander though Scare Zones filled with fog and creepy creatures, which surround some of the the park’s most thrilling rides. If you have limited time in the park and love thrill rides, you may want to invest in Fast Lane. For an additional (hefty!) fee, you’ll receive a Fast Lane wristband that allows you to bypass the regular lines on popular rides, including Wild Thing, Renegade, and Steel Venom coasters. I was quite jealous indeed when I watched Fast Lane holders saunter onto rides for which I’d been waiting for nearly an hour. Soak City Water Park admission is included with your Valleyfair ticket fare. With so many rides, games and shows at Valleyfair, though, it’d be pretty exhausting to try to tackle both the theme park and the water park in one visit. Typically, you can buy discounted two-day tickets instead so you can focus on splashy fun one day and dry land amusements on the other. If you do decide to do both Soak City and Valleyfair in one day, you can stow swimsuits and towels in rentable lockers near the park’s main entrance. In my experience, Cedar Fair amusement park food is underwhelming. Food service at Valleyfair during my last visit was painfully slow, too. If you can, try to fill up by eating before you go. At some point, though, you will probably get hungry for a snack or meal. Your best onsite bets are probably the chain brands like Caribou Coffee, Panda Express, Auntie Anne’s and Subway. Alternatively, pack a picnic in a cooler with ice packs to leave in your car and eat at a nearby park. The picnic grounds at Valleyfair are only for catered events, so don’t get fooled by the Picnic Point signs. You can’t bring meals into the park. However, Homeward Hills Park is only about 2 miles from Valleyfair and Staring Lake Park is around 2.5 miles away. If you or your child suffers from Celiac Disease or has serious food allergies, I strongly suggest this option. I ordered a gluten-free bun at the Northwoods Restaurant and was served a very stale, crumbling bun from a server who did not change gloves between handling gluten food and my order. Another option is to drive to a nearby restaurant and return for more amusements after your meal. Lions Tap Family Restaurant serves up delicious burgers and is less than 2 miles from Valleyfair in Eden Prairie. (This was my favorite restaurant growing up in this suburb as a kid!) If Italian food is what you crave, Zuppa Cucina offers pizza (with gluten-free choices), sandwiches and salads. Be sure to get your hand stamped if you plan to return to the theme park after your meal! Every guest is allowed to bring in one sealed water bottle to Valleyfair. There are refill stations located throughout the park, too. It’s so important to stay hydrated when walking and playing in the sun all day. Plus, bringing your own bottle to refill is better for your pocket book and the environment. Of course, you’ll want a souvenir of your family’s visit to Valleyfair. 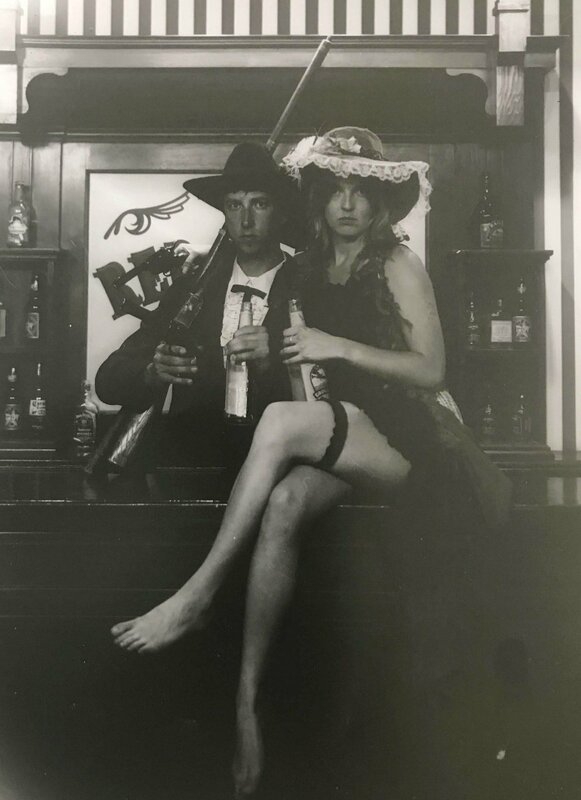 Pop into the Olde Time Photo Shop for an old fashioned photograph complete with Wild West dress up clothing and props. My husband and I went to Valleyfair a few months after we started dating and got one of these souvenir photos taken. It is still displayed on his home office desk. This photo makes me happy every time I look at it, remembering all the fun we had at Valleyfair all those years ago. Have you ever visited a Cedar Fair amusement park? Do you have any questions or additional tips for visiting Valleyfair? Let us know in the comments below! 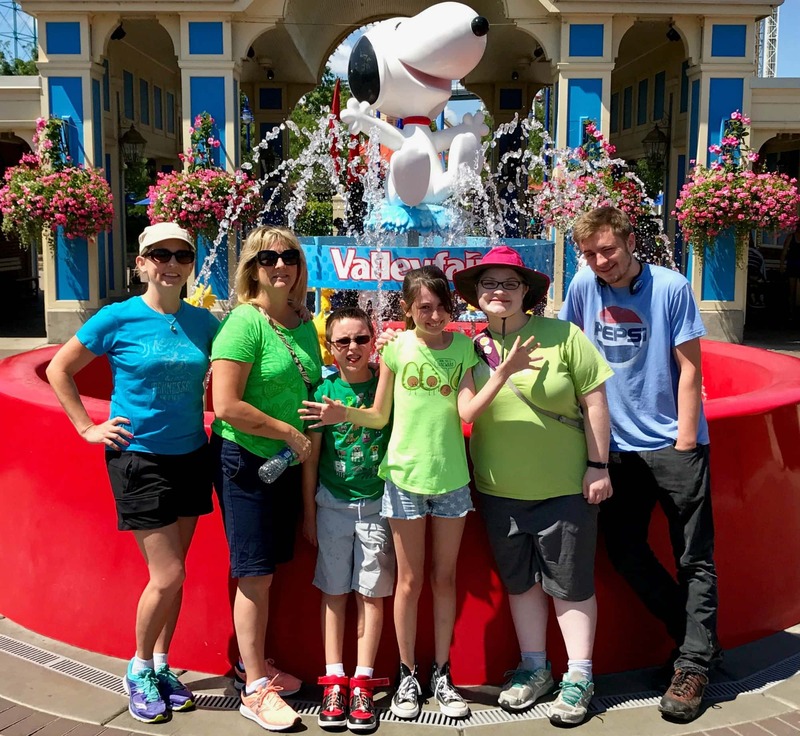 A Note from The Travel Mama: Valleyfair recently provided my family of four with one-day media tickets. All opinions are mine, as always. This sounds a great place. thanks for sharing the complete guide. You’re most welcome, Sapana. Thank you for the comment! That sounds like a fun place to take the kids. Mine would love it there. So many rides for little kids and big kids alike! That looks so awesome! We love going to fairs almost as much as we love to travel. Looks like our next trip is going to be to the Valley Fair! WOOHOO! Any true thrill ride lover would be in heaven at Valleyfair. Enjoy! This looks like such a blast. 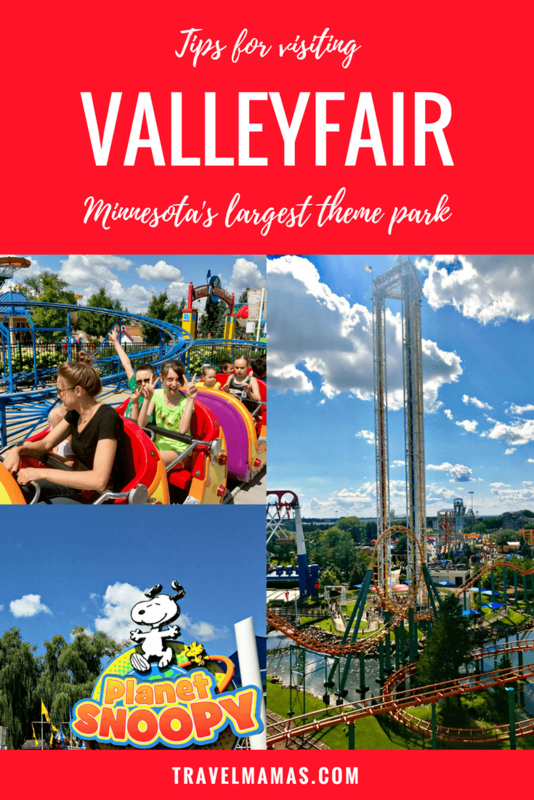 We have some relatives in Minnesota so the next time we visit I’ll have to suggest a trip to ValleyFair. Definitely a fun attraction for your next visit to the relatives! Those rides are great looking. So many tall towers, my kids would love these, I will probably sit out most of it. It is great you can come and go to save on eating. Not in Minnesota but this is a reason to go. Thankfully there are some rides for those of us who don’t like super scary coasters. I find I’m getting more wimpy the older I get! These are great tips. We never eat at theme parks because of my daughter’s celiac and my granddaughter’s food allergies. It’s good to know that there is a nearby park to picnic at. Smart move, Pam! I have friends with Celiac and severe allergies and I know you need to take serious precautions to stay healthy & safe when eating anywhere. This is a great guide. I’d want to schedule everything out or at least having an outline. Thanks for the heads up on the discounts! 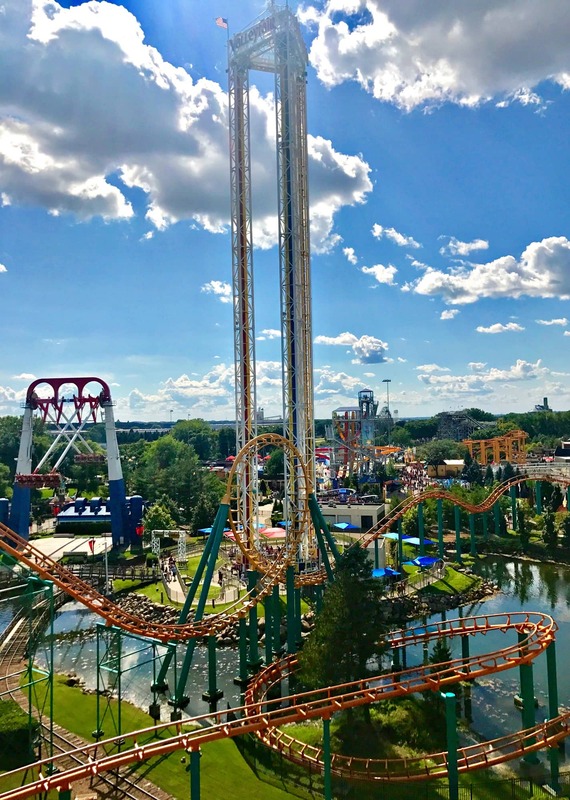 It’s definitely a good idea to come up with a rough schedule of must-do rides before your visit to maximize your time at Valleyfair! I’ve never even heard of this place before, but it sounds like a lot of fun to visit! I bet our kids would have a blast here! Valleyfair such a big park with so many thrill rides and Planet Snoopy rides for kids – it’s so funny that so many people have not hear of this theme park! It would be so nice to be able to go there with the kids! I love that there are plenty of attractions for kids of all ages! It won’t be tough for mine to find rides or attractions that they’d love to try or explore. Valleyfair really is a great spot for theme park lovers like your kids! Awesome place for the whole family! It’s really going to be fun out there and there’s plenty of stuff to expect as well. This place makes the trip even more worth it especially when you’re with the kids. So true – most kids really love a day at an amusement park! This looks like so much fun. I love the sassy photo at the end! This is a great post. One never thinks to plan a big day trip like this, and then you get in trouble, especially with kids, if you are not prepared for what is coming! I always have a game pan before we hit the amusement park! So smart of you, Mitch! I love theme parks, especially ones with roller coasters. I have never been to Valleyfair, but it looks like the perfect destination for family fun. If you like roller coasters, then you’ll LOVE Valleyfair for sure! We’ve been here with the kids once and I can’ t wait to go back! Such a fun trip with the family! I hadn’t been in years and years and am glad we brought the kids to Valleyfair. Enjoy your repeat visit! How fun is this! I would love to feel like a kid again and visit the Valley Fair! Wow this park looks amazing! I’m loving your vibrant photos. It must have been an amazing day! Thank you, Brianne! The whole family really had a good time at Valleyfair. Awesome tips! I mean, these would really help families maximize their visit to Valleyfair. Hope I could visit someday. The park looks fantastic! I hope you can visit Valleyfair someday soon! Veronica – Agreed! And all the more fun because we visited Valleyfair with extended family. The more the merrier! Amindy – Thanks so much for your Valley Fair Soak City locker rental tip!